The roof specified was a two-ply modified bitumen system from Johns Manville. In the three large sections of the plaza, the existing built-up roof was completely torn off, while the drugstore was a re-cover project, notes Andrew Vik, estimator and project manager with Advanced Roofing’s Tampa branch, which operates under branch manager Michael Landolfi. On the drugstore, the roof was vacuumed, and the cover board and two plies were installed over the top of the old roof system. Demolition portions of the project were done at night and application during the day, so business at the mall was never disrupted. Traffic in the parking area was also a key concern. Parapet walls did not surround all portions of the roof, so safety precautions included a safety perimeter; employees outside the perimeter had to be harnessed and tied off to a portable fall protection anchor system by Raptor. Roofing Contractor:Advanced Roofing Inc., Tampa, Fla. Consultant:CBA Roof Consulting LLC, Lake Worth, Fla. Thermal Bridging. Image by GAF. National Nail’s Stinger brand introduces the newly upgraded CH38-2 Cap Hammer. The CH38-2 is an economical, non-pneumatic cap fastener that eliminates the need for hoses and compressors—which also improves safety. Best practice applications for the CH38-2 which features the holding power of a 1-inch cap, includes house wrap, rolled insulation, and roofing felt. The CH38-2 has been enhanced with increased internal handle strength, an improved staple design, track and spring, stronger welds and an added handle grip, all for maximum reliability and performance. The CH38-2 Cap Hammer has a fastener capacity of 168 full, 1-inch collated plastic caps and 3/8 -inch crown staples. Because Rich-E-Board roofing insulation is light and easy to install, it lowers the cost of delivery and handling and can reduce labor costs by more than half. owners, contractors and architects seeking to drive down construction costs and boost energy efficiency. meeting stringent standards for energy efficiency. While conventional insulation requires a thickness of 15 inches to reach an R-value of 50, Rich-E-Board achieves the same result at just 1.5 inches thick. Rich-E-Board can be installed on most roof deck types, including ballasted roof systems, and can support all conventional low-slope roof systems. Lower energy bills: Achieving an R-value of 50 can cut a building’s heating and cooling costs by 8 to 10 percent, according to the GSA. Simpler retrofits: Rich-E-Board enables retrofitted structures to achieve required R-values in less time, with fewer materials, and without costly and destructive building modifications. Reduced construction costs: Because Rich-E-Board is light and easy to install, it lowers the cost of delivery and handling and can reduce labor costs by more than half. Design flexibility: With its slim profile— especially compared with multi-layer insulation— Rich-E-Board saves space, expanding the design options for architects. Rich-E-Board has made a successful transition from the drawing board to the marketplace. Owners and architects have taken advantage of the insulation’s slim profile and high R-value on several building projects. 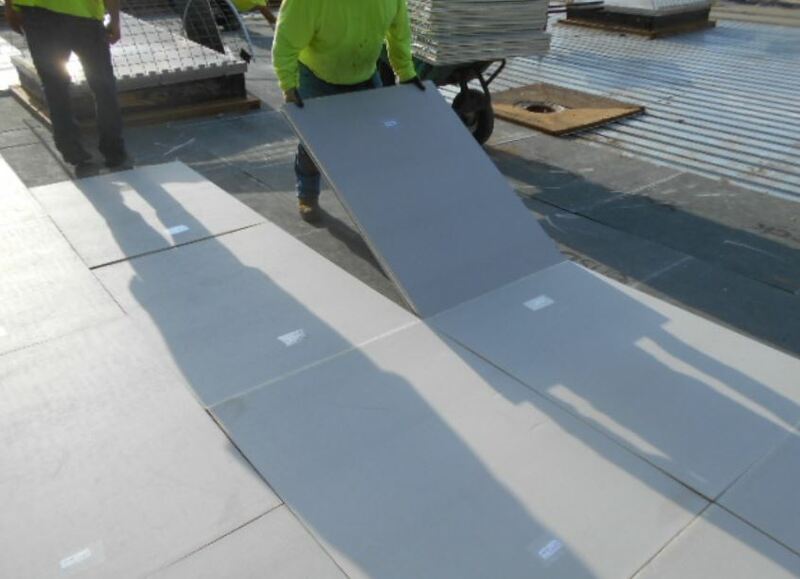 At a government building in Chicago, for example, owners chose to install 3,600 square-feet of Rich-E-Board as part of a roof retrofit aimed at lowering lifetime energy costs. Rich-E-Board’s slim profile also cut construction costs by more than $20,000 by streamlining design and installation. At the Cohen Courthouse in Camden, N.J., Rich-E-Board was selected for the roof retrofit, eliminating the need for expensive building modifications that would have been required for conventional insulation. The decision lowered the project cost by $200,000. Earlier this year, Rich-E-Board was awarded a patent for its design. More recently, the insulation earned its first LEED 4 designation. Collins notes that, in addition to the $5 billion annual market for commercial roofing, Rich-E-Board can be used in walls and other building applications. Rich-E-Board is 99 percent recyclable and made entirely in the U.S. When the fire station decided to replace its aging steep-slope system, the goals included finding a system that would look good, stand up to high winds and resist algae growth. The firemen and firewomen of the Burlington Fire Department, located in Burlington, Wash., reportedly respond to about 1,800 service calls a year. The members of the department are on call 24/7, handling a variety of emergencies, both big and small. Whether it is fighting a fire, performing a search and rescue, or something as simple as retrieving a driver’s keys from the car, the city’s bravest are too busy to have roof issues make their days more difficult. When the fire station began to experience leaks that required countless repairs and patchwork solutions, the City of Burlington knew it was time to replace the entire roofing system and ensure that the firefighters were safe from the elements. Over the last few years, leaks began to appear more frequently in the fire station’s roof, with the worst leaks occurring in the paramedic’s quarters and in the firehouse’s workout room. The water would drip down on the firefighters and ceiling tiles became discolored, creating an unpleasant appearance throughout the firehouse. The intense winds in the area would also cause the shingles of the roof to become loose and fly off. For their new roof, the city wanted a material that was visually appealing and performed against algae and wind. Also, because this was a city project, they wanted to find a contractor who was nearby and a roofing material that was manufactured locally—all of which showed pride in their community. When they considered the criteria, along with the size of the roof—24,000 square feet—the city chose to go with asphalt shingles because they provided a high level of longevity and durability while keeping it affordable. Asphalt shingles offered a heavyweight, wind-resistant roofing material with a number of color options, making it the optimal choice among the design team. Wind resistance was an important factor because the old roofing system sustained considerable wind damage. The winds in the area can reach 65-70 miles per hour. Cascade Roofing Company from Burlington was hired to install the new roof on the fire station. The company has been in business for nearly 30 years and works on both commercial and residential roofing projects. The owner of Cascade, Rick Steiner, explains that asphalt shingles were used on the fire station for a number of reasons. Algae flourishes in humid climates and its spores can be carried by the wind. The temperate but rainy weather found in the Pacific Northwest of the U.S. produces an environment for algae to thrive in. While algae is not known to cause damage to roofs, the dark streaks are unsightly. Cascade used shingle manufacturer PABCO Roofing Products, located in nearby Tacoma, Wash. PABCO’s algae-resistant Paramount Signature Cut Shingle in Oakwood color was selected for the project because it provided exceptional curb appeal. An aggressive modified sealant was used as well as high-wind shingle application—6 nails—to add resistance to wind uplift. PABCO Paramount starter shingles were applied over PABCO Universal Starter to provide a double-layer base. A synthetic underlayment along with an ice and water shield on the leading edges were also used. Shasta HD Ridge was applied to the ridge and hips of the roof to complement the roofline. The roof system covers 24,000 square feet. An aggressive modified sealant and a high-wind shingle application using six nails add resistance to wind uplift. The City of Burlington was thrilled to choose local companies for the project. The manufacturer, contractor and even the supplier were all located nearby. This provided Cascade an avenue for necessary materials to be delivered quickly, allowing them to stay under budget and ahead of schedule. The project took about two weeks and 230 squares of shingles to complete, which is equivalent to the number of shingles necessary for the company to roof six or seven regular-sized homes. Since the renovation was completed, the firefighters are very happy with the new roof. The firemen and firewomen of the Burlington Fire Department can now focus on keeping the residents of Burlington safe. The unique installation of the roof also earned Cascade Roofing and the fire station project the 2017 Bronze Award in the Asphalt Roofing Manufacturers Association (ARMA) Quality Asphalt Roofing Case-Study (QARC) Awards Program. Each year, ARMA seeks out the most beautiful, affordable and reliable asphalt roofing systems in North America. Award-winning projects are selected based on innovation, performance and beauty, and recognize projects that lead the way in areas like weather protection, green roofing or unique utilization of asphalt shingles in a roofing system. ARMA is currently accepting submissions for both low- and steep-slope roofing project installations completed in 2017 for its 2018 awards program. Roofing contractors can submit multiple projects through Dec. 31, and there is no fee to enter. For more information about asphalt roofing systems, the QARC awards program and more, visit the website. Yes, employing immigrant labor is one option though hiring foreign workers places multiple paperwork burdens on employers plus other hurdles to clear, such as language barriers. Instead, according to the Center for Economic and Policy Research, more employers are actively recruiting and hiring those with criminal records. In fact, according to Bloomberg BNA, a medium security prison in Sheridan, Ill., has been training inmates in carpentry and plumbing skills. And the Association of Chamber of Commerce Executives and the Council of State Governments Justice Center jointly agreed to help chamber members hire ex-offenders. The numbers are astounding. According to the Center for Economic and Policy Research, there are between 14 million and 15.8 million working-age people with felony convictions and 70 million with an arrest or conviction record. And Evanston, Ill.-based Northwestern University’s Kellogg School of Management reports 650,000 prisoners are set free annually in the U.S.
As an added perk, employers that hire and retain ex-felons are offered a federal Work Opportunity Tax Credit. (The same tax credit applies to those who hire and retain veterans.) And research conducted by Northwestern University showed ex-offenders are no more likely to be fired than non-offenders after being hired. In addition, the research showed ex-offenders were much less likely to quit a job than non-offenders. With a historically tight job market, you might need to get creative with your hiring policies. And as you explore your hiring options, keep in mind Equal Employment Opportunity guidelines and protections apply when hiring ex-offenders just as they would with any other job candidate. The new LMS features an expanded search tool, 24/7 access to ASTM International training content, enhanced reporting capabilities and customized curriculums. Training modules are accessible from any device. From the new homepage, learners will be able to find new training modules, access completed training, browse catalogs, and print certificates. In addition, courses can be downloaded and completed offline. Accirdng to the organization, there will be continued updates to the LMS, including the addition of a “video wall,” where learners will have easier access to training videos. For more information, visit the website or contact the learning management team via email at LMS_Support@astm.org. Roofinox America recently joined with ATAS International to educate more than 125 contractors, architects, engineers, distributors and building owners about the latest advances in building materials at the ATAS Product & Education Expo. Held at the ATAS headquarters in Allentown, Pa., the event included the display of Roofinox’s full line of stainless steel roofing products designed to offer long-term sustainability and corrosion resistance for virtually all forms of roofing applications. The Roofinox product line consists of Roofinox Classic brush-rolled stainless steel, Roofinox Pearl bead-blasted stainless steel, Roofinox Plus ribbed stainless steel, Roofinox Chroma mirror-rolled stainless steel and Roofinox Tin-plated (Terne), the only tin-plated stainless steel product specifically developed and manufactured for roll forming and fabricating, according to the manufacturer. Designed to offer long-term sustainability and corrosion-resistance for wall-cladding, flashing, rainware, interior design and virtually all forms of roofing applications, each Roofinox product is also designed to be very easy to seam, while offering superior aesthetics and reducing machine and tool wear. ATAS International manufactures metal roofing, metal wall cladding, metal ceiling panels and metal accessories, produces systems for commercial and residential buildings. The ATAS metal roofing and metal wall product line offers more than 20 profiles available in stainless steel, aluminum, steel, zinc and copper.